Full Depth Reclamation is the process of reconstructing an existing road using the existing asphalt and base material as aggregate for the new base. The new base material can consist of varying amounts of the reclaimed asphalt paving (RAP), existing base material, cement, and water. 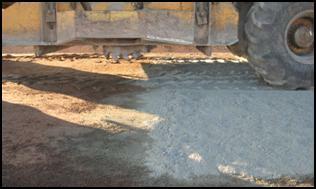 Existing “dirt” roads with roadbase material or concrete paved roads can also be treated. The cement treated base material can then be overlain with asphalt or concrete paving. This design process is cost effective, especially in remote areas, since the reconstruction of the road eliminates the haul of new base material. Its cost effectiveness is especially appealing to county governments, who have several miles of roadways in remote areas of the state. 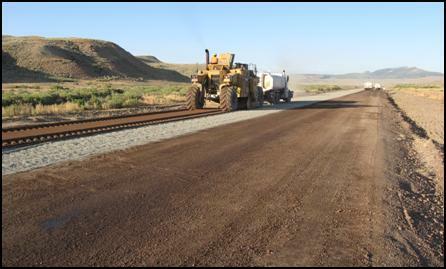 JFC has successfully completed the design of a 5.5 mile stretch of road in Sweetwater County, Wyoming. Design of this Project consisted of analyzing the existing base and asphalt material to determine the proper mix design for the new road. Since the Project consisted of varying depths of existing asphalt, some of the asphalt was milled off to achieve the optimum amount of RAP in the finished product. Once the in place material was analyzed, a proper mix design consisting of type and quantity of cement, depth of reclamation, and water quantities were developed. The Project was bid and the winning contractor utilized a reclaimer to pulverize the in place asphalt and base material. Once pulverized, cement was evenly distributed in a measured quantity and a reclaimer was used to mix and develop the new base material. The new base material was compacted and cured for a predetermined amount of time. Once cured, microcracking was conducted to control shrinkage cracking to maintian ride quality. The Full Depth Reclamation process resulted in an extremely cost effective and hard base material that produced an exceptional base.